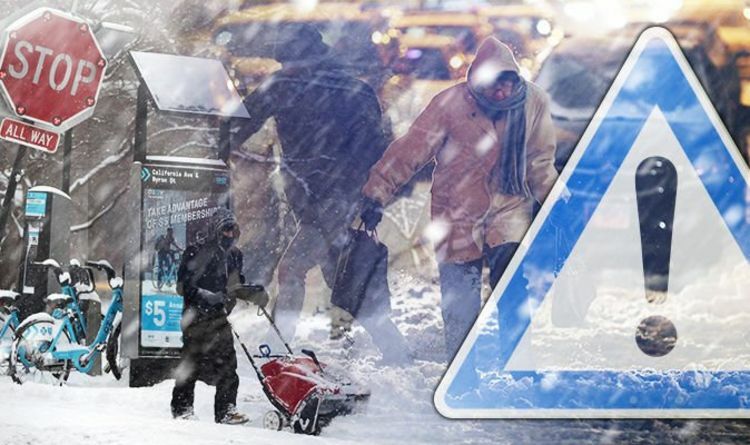 Chicago, Wisconsin and Michigan have all declared a state of emergency as weather forecasters warn an arctic polar vortex will freeze the northeastern USA. Tom Skilling chief meteorologist at WGME TV said the “barbaric” temperatures along with brutal winter conditions will freeze flesh in just five minutes. Temperates will plunge as low as -27C (-16F) overnight on Tuesday and into Wednesday morning as the coldest air mass in three and a half decades hits the Midwest. Mr Skilling told BBC Radio 4’s Today programme: “This is not just bothersome. This is downright dangerous. It is brutal. “Your flesh will freeze in about five minutes with exposure to this temperature wind chill combination. “This is dangerous and I guarantee you in the coming days we are going to hear that people have died in this. There is no way to avoid it. “I have never seen a cold wave of this magnitude in which that hasn’t happened. “So all levels of Government are on the air tonight in every way they can to reach out to the public. The freezing weather is set to sweep across the US and unleash arctic air across the US Midwest, clipping the Great Lakes, the Ohio Valley and pushing on into New England. The life-threatening freeze is set to bring temperatures to record lows before dissipating by the weekend, the National Weather Service reported (NWS). The polar vortex is a mass of freezing air that normally spins around the North Pole, but has slipped southward and swirled into the United States, forecasters said. Wind chills are expected to be between -15C to -30C, with a high of 3 degrees and a low of -22C, and it is expected to only get colder from there. Wednesday's expected high, -13C, and wind chills will make it feel like as much as 50 degrees below freezing. It has the potential to be the second coldest day in Chicago history. The coldest temperature ever recorded in Chicago was -27C on January 20, 1985. Governor JB Pritzker said on Tuesday he has issued a disaster proclamation for the entire state. Mr Pritzker said: ”This storm poses a serious threat to the well-being of people around the state, and we will use every tool at our disposal to keep our residents safe. "This disaster proclamation ensures that the state of Illinois has the flexibility to effectively and efficiently respond to the needs of local governments during this extreme weather event."